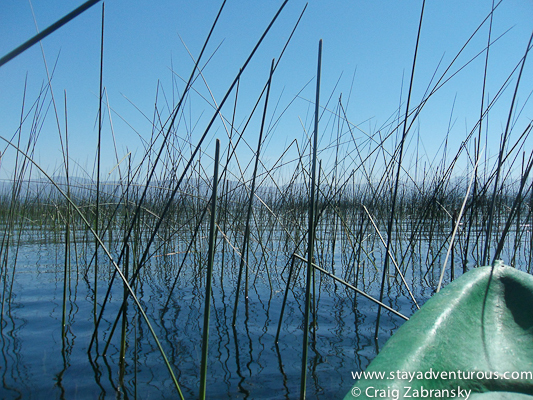 A visit to Guatemala is not complete without a visit to Lake Atitlan. The massive lake provides options for different tourist types, but regardless of where you spend your time, the water invites and you will spend time on the lake (or even in it). One of my favorite ways to explore is in a kayak. I rented one in the town of San Pedro relatively cheaply. I didn’t plan to paddle far (the lake seemed enormous by kayak), but I did spend an entire day on the water. It is easy to get lost in the beauty. I moved deeper into nature with each refreshing stroke, and navigated through tall grass and even trees along the shoreline as I paddled further along the coast. Further and further into my day and deeper into the heart of Guatemala I traveled. After an hour or two, I noticed a small, secluded beach with a few people swimming and decided to head ashore for a closer look. I beached and secured my kayak on the sand, then headed back toward the lake to put my feet in. Refreshing. Very refreshing in fact. It was time for a swim. It’s no secret I prefer the ocean, but the clear water seemed very appealing under the warmth of the early afternoon sun. Stories of pollution from 2009 do scare many from taking the plunge, but guide books list the lake as “safe” and I noticed many local Guatemalans in the water too. Follow the locals is advice I often honor on the road. I dove in and cooled off. On the beach I noticed a few European Spanish School students in bikinis sunbathing next to a colorful Mayan washing her clothes. Two worlds collided and coexisted. I wondered if each understood the other or if they judged their choices. Later, back in San Pedro, and after the sunset on Lake Atitlan, I discovered a few more locals down by the water finishing laundry as their kids swam in the lake. They started to ask me questions. They were very open and curious as we conversed (in Spanish) and I responded with answers about my travels and asked questions of my own too. We both enjoyed learning. I will always appreciate the moment we shared. Yes, the experiencing of cultures through travel it is a good thing and my kayak excursion on Lake Atitlan reminded me of that fact. This post is part of the Autumn of Adventure and the Adventure Travel Mindset as well as the Get to Know Guate series. Craig, your post reminds me of a time when we were in a rural part of Jamaica at a local beach. We were the only foreigners there. After making our place near a family with small children, we went for a swim. The little kids came over and we began chatting and playing in the sand together. These particular children had never met a white person, curious they touched my skin and hair. The Mom scolded them, I told her, it was ok. The little girl asked me why my hair was so straight. I told her it was how God made me and I wished I had pretty hair like hers. She smiled. Stephanie, isn’t such stories that make travel and discovery so rewarding… thanks for sharing. Craig, great write up! 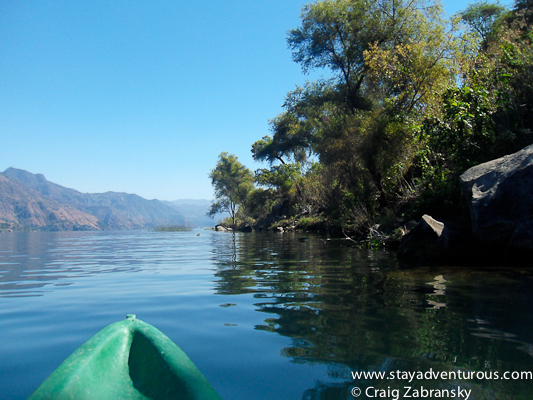 I hope to end up in Guate here in the coming weeks and of course have marked Lake Atitlan as a must see. Great site and will be following you! 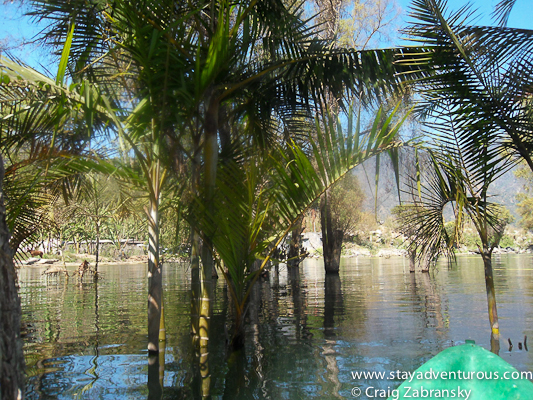 Hopefully you will see some Guatemala postings on my site, untrackedtravel.com very soon. Excellent Adam, enjoy Guatemala. It’s an adventure. I’ll take a look at your site, and definitely check back here in February when my series “Get to know Guate” continues. That is one picture of contrasts for sure – good eye. 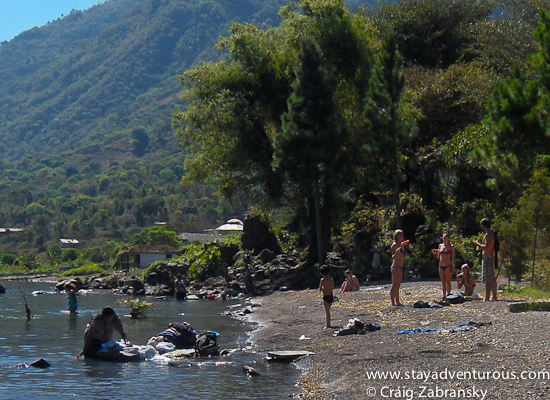 I have always heard of Lake Atitlan growing up) but had never seen pix or read about it. Very cool. love the photos from the kayak perspective and your thoughts of two world colliding. lovely share, Craig! Oh, so perfect for hot summer days like in we’re having now! Kayaking, swimming, and conversing with others sounds like the perfect way to spend any day. I am looking forward to more articles on Guatemala. It looks like a beautiful country.